Mike was raised and educated in Saugus, Massachusetts; and joined the funeral home in the fall of 2014. He has brought with him a strong organizational background after several years in the corporate environment. He has found a new home with us and is one of the kind voices you will hear when contacting the funeral home. We welcome him and the compassion he brings to the Diaz-Healy Family. He earned a bachelor's of science degree in business administration from Salem State University and an Associate Degree in Funeral Service from The American Academy McAllister Institute. Dan Healy is a first generation funeral director, and holds a degree in mortuary science from New England Institute of Applied Arts and Sciences, Boston, Massachusetts. He has owned and operated Connor-Healy Funeral Home and Cremation Center of Manchester, NH for over 30 years. 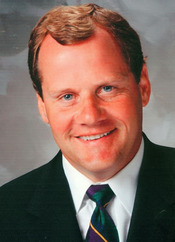 He currently serves as a director on the board for St. Mary's Bank in Manchester. He is also a member of both the New Hampshire Funeral Directors Association and the National Funeral Directors Association. Dan served on the Manchester School Committee for 18 years, where he served as Vice-Chairman.